A visit to a postcard fair held in Stockport Town Hall in February 2014 left us a little poorer, but the proud owner of two interesting Davenport postcards by the prolific Stockport-based company publisher 'Grenville Series'. Inspired, I have attempted to create the same views in 2014, subject to the difference in camera and the inadvisability of standing in the middle of a busy road to frame a picture. Both views are instantly recognisable today, albeit with some differences. Our first example was posted on 21 October 1939, shortly after the outbreak of World War II and towards the end of the heyday of the Grenville Series. 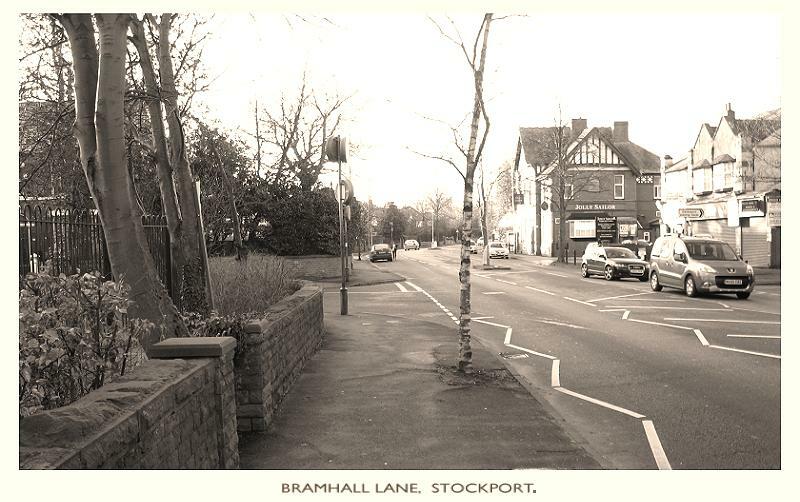 It shows Bramhall Lane after the widening works carried out by Stockport Corporation in 1937 by purchasing land from the house-owners on the left-hand side. The stone wall, which is still a feature of the Lane in 2014, looks quite new. The 'Jolly Sailor' hotel (218 Bramhall Lane) was built in 1895, and the two purpose-built shops at 214 and 216 date from about 1910; No.214 was a Fruiterer in the 1911 census. A 1934 directory lists no.214 as a branch of the Stockport Industrial & Equitable Co-operative Society Limited, and 216 as a branch of Nathaniel Gould and & Co. Limited, grocers. Oddly, however, this branch of Goulds never appears in the telephone directory. The placards outside and the pillar box suggest that by 1939 it was the newsagent / post office that many of us will remember. A car is parked outside the pub, and another heads off in the distance. A telephone box is already in place, and a 'Belisha beacon' - named after Leslie Hoare-Belisha, the Minister of Transport, who introduced them (and the 30 mph speed limit) in 1934 - marks the point where pedestrians have priority to cross. Metal studs in the road marked the way: the associated 'zebra' stripes did not appear until some years later. Our 'postcard' from 2014, and the stone wall remains, although the houses behind it, 'Glenariff' and 'Rothberg' were demolished in 2005 and replaced by the apartment building 'Southlands.' (See our 'Old and New Homes' feature.) The door and window in the near end of the 'Jolly Sailor' have been replaced by a large window, and the shop at no 214 has been extended at ground floor level, possibly during its days as an off-licence. It is closed and shuttered, hopefully awaiting a new tenant. No. 216 no longer operates as a post office, but continues as a 'convenience store.' The zig-zag lines mark the 'pelican crossing' just behind the camera, and 'refuges' and a right-turn lane now occupy the middle of the road. The big tree in the middle of the pavement on the corner of The Crescent no longer blocks the view. 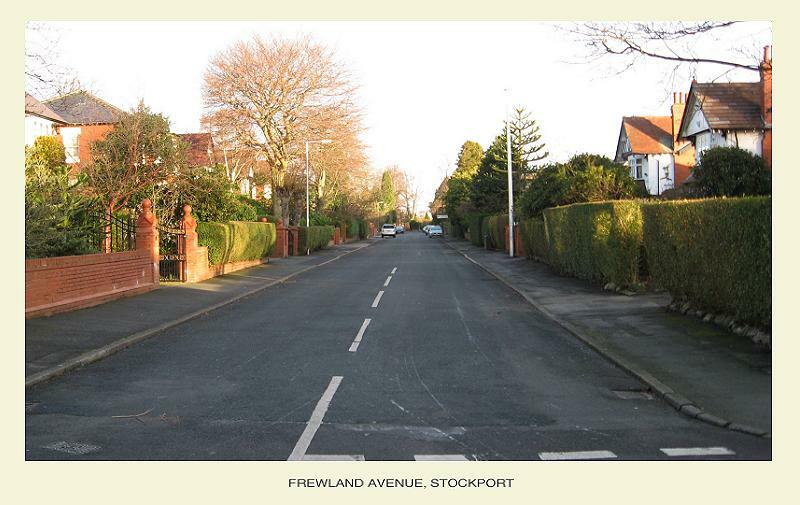 Parallel to Bramhall Lane, not far from the scene shown on the other card, runs Frewland Avenue. 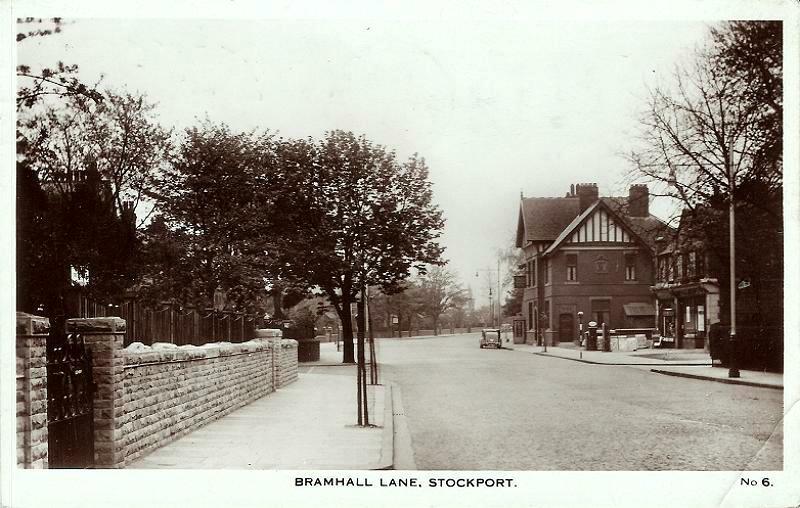 This Grenville card was posted in 1917, and shows the view from the south end of the Avenue looking towards Stockport. At the time, this was quite a modern scene: the land was sold in 1904 by Hugh Archibald Christy; at the time the Christy family of hat manufacturers had left nearby Highfield House and its estate for more rural homes elsewhere in Britain. The new owner, according to the Land Registry was a John Frew. 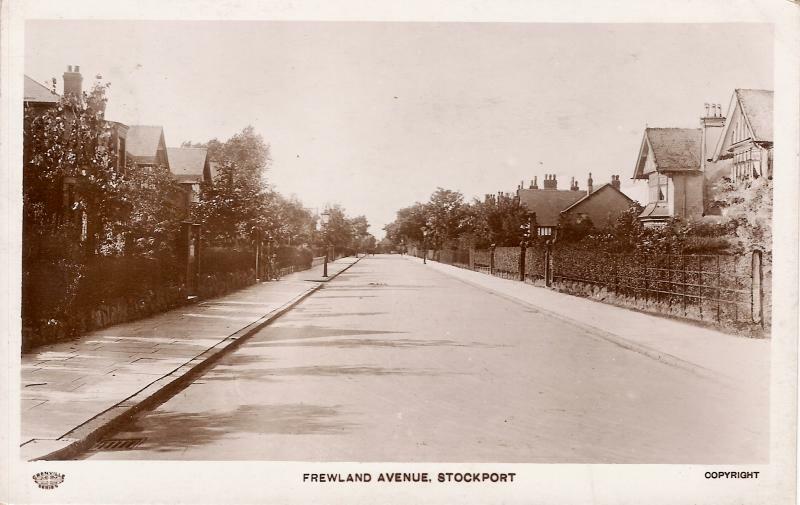 He does not seem to have been a Stockport man, and he still owned 29 and 31 Frewland Avenue at the time they were sold in 1919-1920, but which of the various John Frews in the census records he might have been eludes us so far; telephone directories from 1911 show a Manchester silk manufacturing company called John Frew and Sons, which may be a connection. The two houses on the right of the picture, which have 'retouched' in the photograph, are nos. 27 and 29, with no. 31 the first to be built. Our 2014 version: the houses in the foreground still stand; the most conspicuous changes are the alterations to front boundaries, including wider gateways suitable for cars. The large house beyond the two on the right has gone, replaced by two modern houses, built in a sympathetic style but with the lower profile characteristic of modern design. The lost house, 'Dunraven', no.25, was in 1911 the home of Ernest Herbert Atkinson (aged 46), linen and cotton merchant, born in Bradford, Yorkshire, his wife Sarah and their three sons Ernest William, Richard Charles and Frederick Norman. Ernest William joined his father in the business, which was based at 6, Oxford Street, Manchester: one imagines them as early 'commuters' from Davenport station. The family was still at No. 25 in 1934.